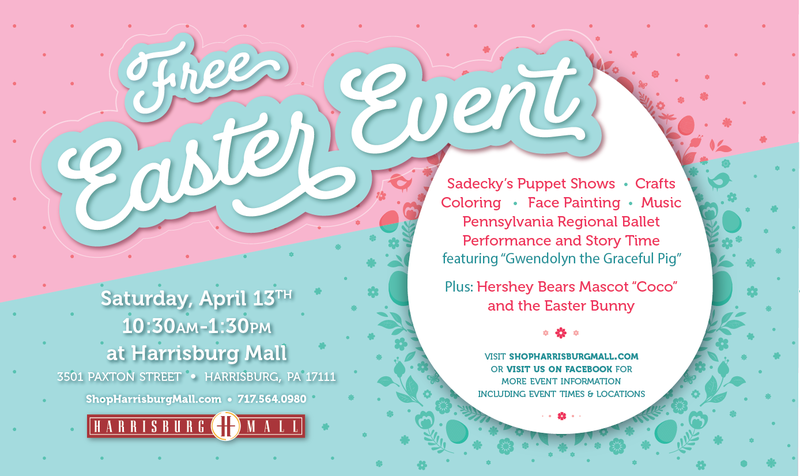 HARRISBURG, PA (April 1, 2019) – Harrisburg Mall will sponsor its annual free Easter Event on Saturday, April 13 from 10:30 a.m. to 1:30 p.m. featuring live puppet shows, free face painting, crafts and coloring, music and special appearances by the Hershey Bears mascot and the Easter Bunny among other activities. Harrisburg Mall is located on 3501 Paxton Road off Exit 45 in Harrisburg. For additional information, call 717-564-0980 or visit www.shopharrisburgmall.com. Sadecky’s Puppet Showsat 10:30 a.m. (The Magic Book), 11:30 a.m. (A Change of Heart), and 12:30 p.m. (The Magic Book)with each performance lasting approximately 40 minutes. The shows will take place on the first floor Center Court and they are kid and parent-friendly. Performance by Pennsylvania Regional Ballet and story time featuring “Gwendolyn the Graceful Pig” on the second floor Food Court Pavillion: 12:15 p.m. to 1:15 p.m.
Harrisburg Mall is a one million square foot regional mall with more than 70 tenants, including anchor stores Macy’s and Macy’s Backstage, Bass Pro Shops, Destination XL, 2nd & Charles and Regal Cinema’s Great Escape Harrisburg Mall Stadium 14. St. John Properties, Inc., a Batlimore-based real estate development company, owns and manages the property. Visit www.shopharrisburgmall.com.